In a zippered plastic food bag, slightly crush Frosted Toast Crunch™ cereal by squeezing bag. Set aside. In a large bowl, whisk Bisquick™ baking mix, milk, eggs, 1/2 cup strawberry syrup and vanilla until smooth. Heat a lightly greased griddle to high and cook pancakes, about 1/4-cup batter for each, until golden brown. Place one hot pancake on plate. Spoon berries over it, then top with second pancake. Finish with more berries, whipped cream, drizzled strawberry syrup and Frosted Toast Crunch™ cereal on top. Serve immediately and repeat as necessary. Berry pancakes hook up with Frosted Toast Crunch cereal for breakfast that rolls like a yummy dessert! I'm starting to get that pre-summer twitch. In between every few words, I involuntarily yell "strawberries!" Can't help it. Just happens. And as if on cue, this new Frosted Toast Crunch bopped on the scene. It's a cousin to Cinnamon Toast Crunch, which we actually eat dry at my house, as finger-food snacks, as well as with milk for breakfast. We like it that much. This new frosted flavor is straight up addictive. So, I was day-dreaming about how to use that new FTC cereal when one of those summer twitch moments came blurting out: Strawberries! 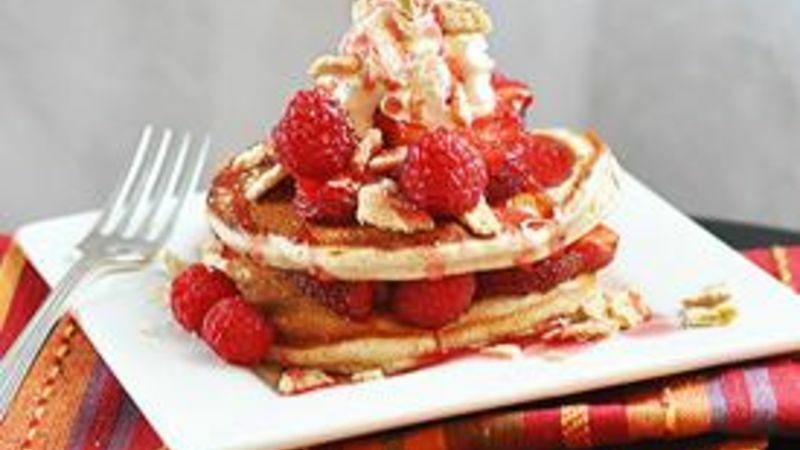 My insta-vision: These Frosted Toast Crunch Pancakes -- golden pancakes stacked with Strawberries! (sorry), raspberries, sweet cream, berry syrup and Frosted Toast Crunch cereal. Gotta say, this was beyond brilliant. I swear I'm gonna find a way to employ this dude in a ton of recipes. So for this one, toss the crunchies into a plastic bag and give 'em a squeeze. Just enough so there are big and small pieces, not so much that you make FTC flour. There. This is your topping. Meet the rest of the players: Bisquick, berries, milk, eggs, strawberry syrup and vanilla. Woot. Whisk up basic Bisquick pancakes, then add strawberry syrup and a swig of vanilla to the batter. Sweeeet! Griddle up those 'cakes and -- you know this part -- cook 'em until they're golden. Stuff berries between two pancakes, and top it all off with more berries, sweetened whipped cream, drizzled strawberry syrup and then, of course...Frosted Toast Crunch cereal. So those were my beauty shots up there. Nice 'n neat 'n perty. But here's reality. It's so good, we made pancake paloozas. Dare ya -- own it! Frosted Toast Crunch is new, but Cinnamon Toast Crunch is a popular veteran of cereal cupboards everywhere. Try these treat recipes that feature Cinnamon Toast Crunch -- and if you're adventurous, sub in Frosted Toast Crunch for kicks!